Matthew Wright joins the B. Thomas Golisano College of Computing and Information Sciences in August, where he will lead the new multidisciplinary Center for Cybersecurity. The Center for Cybersecurity will open this fall located in the Center for Integrated Manufacturing Studies (CIMS) building on the RIT campus. Wright comes to RIT from the University of Texas at Arlington where he was an associate professor in the Department of Computer Science and Engineering and co-director of the university’s Information Security (iSec) Lab. 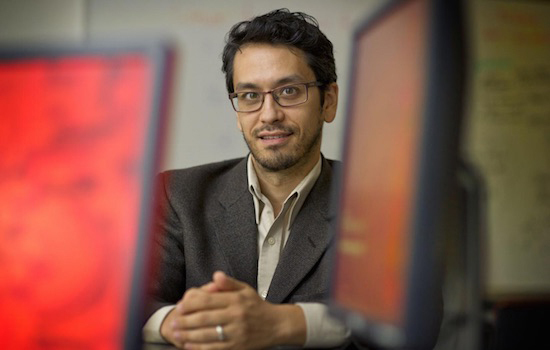 He is a recipient of the NSF CAREER Award, which has supported his research in designing an anonymity system for the next-generation internet. With the center, Wright and RIT plan to develop a widely recognized cybersecurity research program that highlights the strengths of RIT’s faculty and student researchers. Researchers will publish papers and seek funding from the National Science Foundation, the Defense Advanced Research Projects Agency (DARPA), other federal agencies and by partnering with industry. “One of the first things we want to do is develop research themes—directions that will allow us to talk about our research in an accessible way,” said Wright. “Some themes that we have discussed so far include human-centered cybersecurity, the Internet of Things and other emerging technologies, forensics and privacy. The new center will also strengthen ties with the cybersecurity industry through student recruiting and a Pentesting Laboratory, where businesses can get their software and systems tested for security vulnerabilities by teams of students who seek to penetrate their security measures. Insights from cybersecurity research will also be used to enrich classes at RIT and outreach programs for prospective computing security students. Wright received his bachelor’s degree in computer science from Harvey Mudd College, and his master’s and Ph.D. in computer science from the University of Massachusetts Amherst. His areas of interest include systems for providing internet privacy, usable security and privacy, and secure and reliable peer-to-peer and ubiquitous computing. The Center for Cybersecurity is made possible through a $3 million commitment from RIT and the Golisano College toward Sociotechnical Approaches to Cybersecurity research. The initial cybersecurity team will consist of 25 faculty researchers from five different colleges at RIT, including the disciplines of computing, engineering, public policy, business, psychology, mathematics and English. In 2012, RIT became the first university in the nation to create an academic department solely dedicated to computing security. RIT’s Department of Computing Security is housed within RIT’s B. Thomas Golisano College of Computing and Information Sciences. In 2014, the college was awarded a multimillion-dollar National Science Foundation CyberCorps® Scholarship for Service grant that supports cutting-edge computing security education and attracts top students to RIT.